When you think of “save-the-date” reminders for weddings and other special occasions, you probably think of magnets or post cards, which are two of the most popular methods of reminding guests of the upcoming nuptials (or whatever the occasion may be). 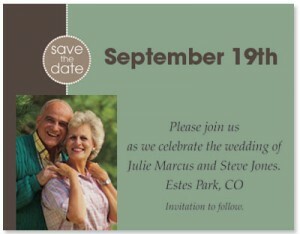 Save-the-date wedding tips from PaperDirect will help you remind your guests without sending them the same thing most people do. Magnets and postcards are great reminders, but there are other interesting ideas you can use so your friends and family save the date! Whatever mode of delivering your save-the-date you choose, be sure to select bright colors that will get the recipients’ attention. 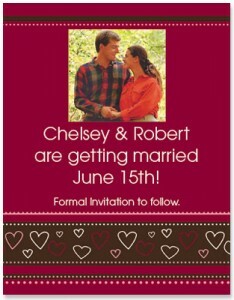 Use colors and graphics that apply to the wedding date or theme of the wedding. Pastels can be used for springtime weddings, and beach/ocean scenes can be used for beach weddings. If possible, include a picture of you and your future spouse in the save-the-date reminder as this gives the reminder an added special, personalized touch. 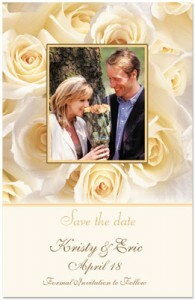 PaperDirect has a number of save-the-date photo cards from which to choose.